Mama M - She is a full-time high powered business woman by day. By night she is the masked superhero Vixen, ridding the streets of scum with her super human strength and stiletto boots. (soon to be) Mama J - She is a full time accessories designer by day. When she suits up with Vixen at nightfall, she is called Roxie, leather clad super-hero and master kendo swordswoman. Mama G - She teaches little ones about the Constitution by day. At night she teams up with the other Mamas, as her alter ego Trixie, telepathic super-hero who can move things with her mind. Mama E - She works in the corporate world by day. Rounding out the Fab 4 Mamas is, Sexla, the sultry, bustier-clad temptress, who uses her super-femininity (and kung-fu skills) to overpower her enemies. Mama S - Our legal eagle, and latest addition to the Mama Bloggers. Now making us the Fab 5, we introduce Electra - she has the ability to harness the power of electricity, as well as the awesome power of invisibility. 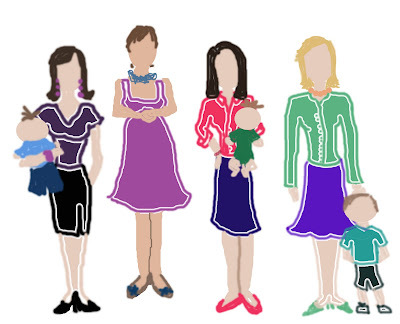 We were lucky enough to have a group of 10 new mamas contribute to our research for this blog. We thank them all for their time and effort, and hope they will pass this on to other new Mamas around the globe! Sign up to follow the blog as we will be posting a few times a week with more product reviews, things to do around Boston, activities for your kids, life stories, more Words of Wisdom and just funny crap that happens when you are a new Mama!